Owner of Thomas Performing Arts Center Lauryn Thomas talks to students about entrepreneurship. FARMINGTON - Eighth graders at Mt. Blue Middle School had the opportunity to explore their futures on Thursday with the annual Career Day. 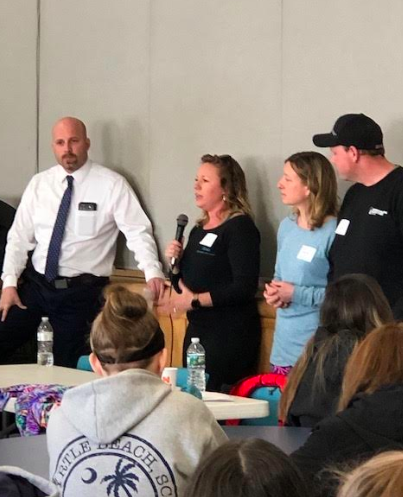 While seventh graders went out into the community to shadow professionals, older students got to quiz more than 25 professionals representing 11 different careers in a series of rotating presentations and workshops. Students were able to choose which presentations they participated in, ranking their choices from most desirable to least. Jobs included those from the health field, to engineers, to pharmacists with a special emphasis this year on entrepreneurs. A panel of three business owners, all Mt. Blue High School graduates, spoke to the students to kick off the day. Organizer Jan Welch said the event has been going on for 20 years, with no plans of stopping. "We tweak it every year to offer some different careers, but we always try to include some of the standard ones, and we always try to work with Foster Tech Center," Welch said. High School students roamed the halls, talking to kids about the different programs offered through FTC that could give them a leg up in the profession they're interested in. "If we have an engineer come, we put some high school engineering students in there," Welch said. Linking the two helps students visualize what their career path could be, Welch explained, and helps get them excited for high school.